On a nearly forgotten corner of an island in the San Francisco Bay, within a refurbished WWII-era warehouse, a man in rubber boots stands atop a six-inch bed of damp seeds that are trying their best to sprout. With an oversized rake, he gently turns the plump grains in a rhythmic ritual that dates back to the beginnings of brewing itself. While some features of the 20,000-square-foot floor-malting facility around him reflect modern innovation, he puts his back into the deeply traditional task of raking, requiring hours of methodical human attention per week. The fruits of his labor will be partially sprouted barley finished in a massive kiln — skillfully arresting the sprouting while preserving the powerful enzymes inside each kernel. 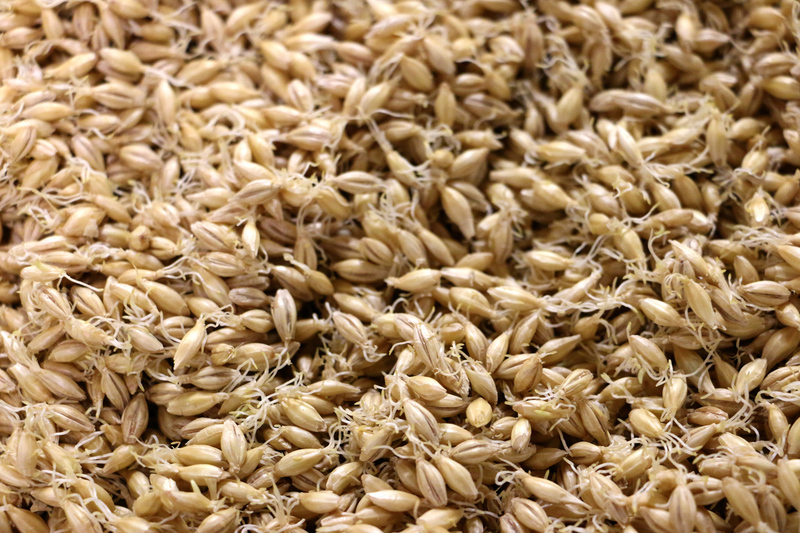 The malting process is the secret to making mere grain become deliciously fermentable. Through this highly manual variation known as floor-malting, the maltster creates a fresher product with better flavor than malts made in gigantic, efficient industrial malt facilities. Though the ritual is old, this operation is new. Thirty years ago, when the new craft brewing community first picked up a Celebrator to see if they were in it, there was no upstart local maltster to provide artisan ingredients. 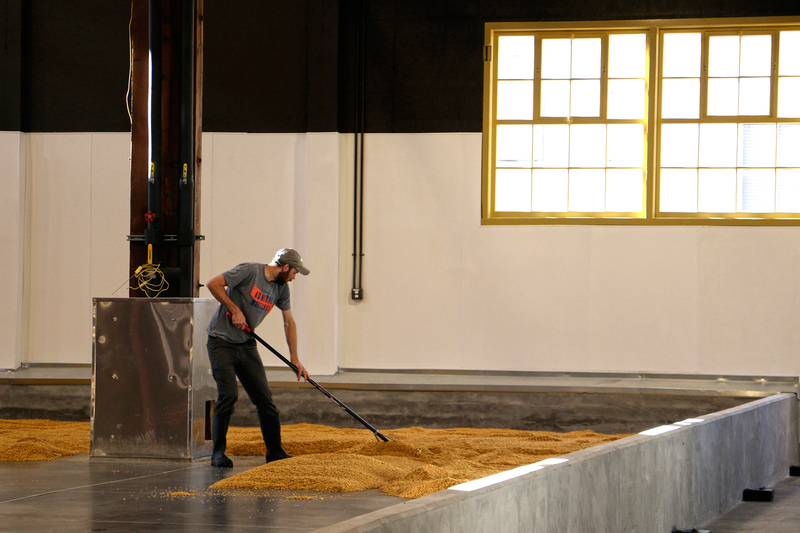 Admiral Maltings, now open at Alameda Point, next to Oakland, is the first malt facility built in California since the beer culture came crashing down at the start of Prohibition. The new business — in production since August — is not only employing traditional methods, but also seeking out experimental barley strains and preferred farming methods, all within California, taking the product one step further into the realm of local premium ingredients. As you may guess, brewers and distillers are excited to try the new malts. Walking into the facility, you’re greeted by the pleasant aroma of whole-grain crackers and sliced cucumber — or perhaps alfalfa sprouts. The malting floor area, when not covered with moist barley, is polished and sanitized with a machine that looks like a small ice rink Zamboni. Barley from California farms arrives to be soaked for 38 to 42 hours in large steep tanks. When ready, sprouting kernels are raked on the smooth, radiant-cooled floor for about four days. While malted grain undergoes the kilning process, the waste water from soaking the seeds goes through a NASA-designed reverse osmosis filter that purifies 3,000 gallons of dirty water in eight hours, repeated several times during the multi-day soak. 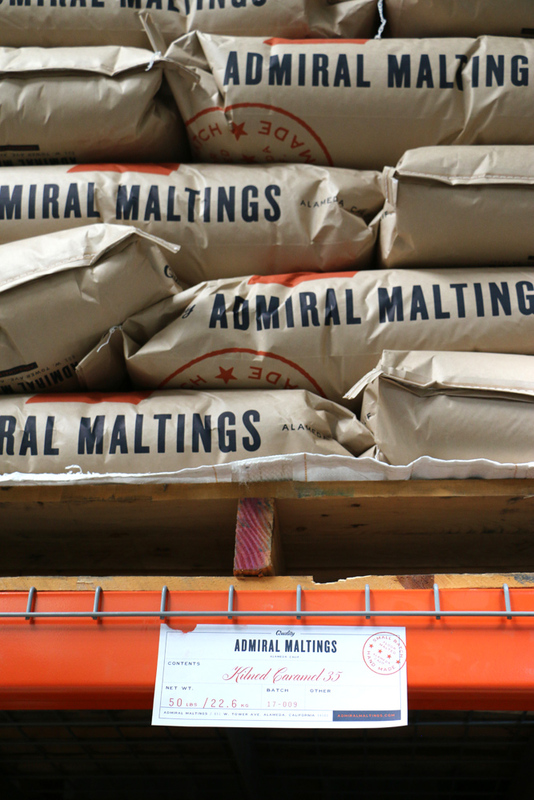 Currently, Admiral Maltings is processing about seven batches a month, with an eye on stepping up to 14 as demand increases. Although the operation looks large by local craft brewery standards, Admiral will produce approximately 1,440 tons of malt per year. By comparison, one of the world’s largest malteries, Cargill, made more than 2 million tons last year in multiple large facilities. 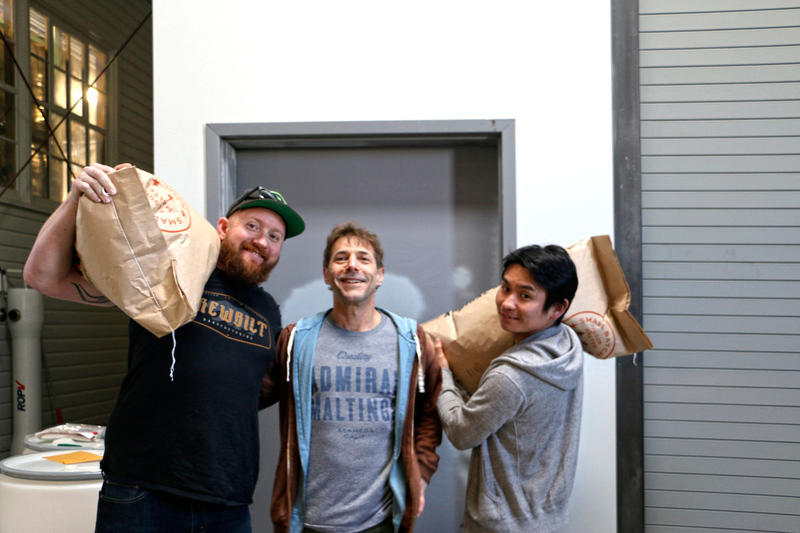 The three men who pulled Admiral Maltings together come from the worlds of craft beer and organic farming, united by passion for quality and authentic ingredients. Cofounder Ron Silberstein has embraced his new industry with the energy and enthusiasm he brought to his ThirstyBear Organic Brewery in San Francisco as founding brewmaster and owner in 1996. He became interested as he began to meet farmers who wanted to grow organic barley for beer. In 2010, when he had a batch of California barley malted for him in Colorado because there was no local alternative, he discovered the nascent micro-maltster movement. Fellow brewer Dave McLean followed his love affair with malt since founding San Francisco’s Magnolia Brewing Company in the ’90s, where he specialized in British beers, importing special floor-malted Maris Otter from a traditional maltster in England. The third member of the team, Curtis Davenport, has a background in organic farming that led him into growing barley and wheat for brewers and artisan bakers. In 2013, he designed and operated a trial malting system in Southern California. Davenport and Silberstein both sought out professional training from the Canadian Malting Barley Technical Centre, graduating from the premier course in this subject in North America. Davenport, as the head maltster, juggles the operations, from producing sheets proclaiming the complex, laboratory-confirmed specs of each malt batch to pulling on his boots to undertake those critical raking passes around the roomy floor. Craft beer drinkers look forward to new hops, which are created by exciting breeding programs locked in a feedback loop with brewers and drinkers. For a long time, new strains of barley, which take years longer to develop than hop strains, were driven by large industrial breweries that wanted bland malt with diastatic power: plenty of enzymes to convert the starch in rice or corn along with the starch in the barley malt itself. “For all-malt breweries, we don’t need a nuclear bomb’s worth of diastatic power when you can turn on the light bulb with some nice windmill-generated electricity,” Silberstein explained with a twinkle in his eye. Finally, varieties can be bred for flavor. 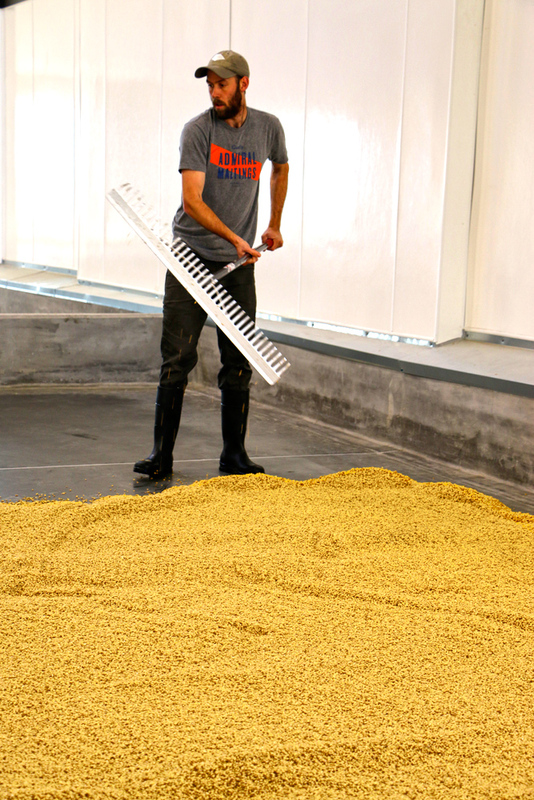 Bringing back California malted barley appeals to environmentally thoughtful brewers. Barley varieties are essentially grasses that are harvested for their seeds. In California, with its wet winter and dry summer climate, grass thrives in the rainy portion of the year and goes to seed before drying up in the summer. Barley is well suited for this cycle in this drought-prone region, not needing irrigation during the dry months, unlike an almond tree, for example. Currently, most barley grown in the state is used for livestock feed. Farmers put money and effort into boosting the crop’s protein content for cows. Curiously, barley grown for malting offers a cost-saving advantage to the farmer by requiring less protein, and by extension, not much, if any, industrial fertilizer. Although people started growing beer-quality barley locally, the carbon footprint of a batch was not much different from those made with malts kilned in the northern reaches of the Midwest or over the border in Canada. Ken Grossman, owner of Sierra Nevada Brewing Company in Chico, Calif., said, “We’ve been growing barley and hops at Sierra for nearly 10 years.” Sierra, too, was forced to ship its Estate Series crop round-trip out of state to be malted. While Admiral qualifies as a small floor-malting facility, its naval warehouse has plenty of room to include a taproom, The Rake, where patrons can peer through an interior window to see the malting process on the floor while they sip beers made with the malt. 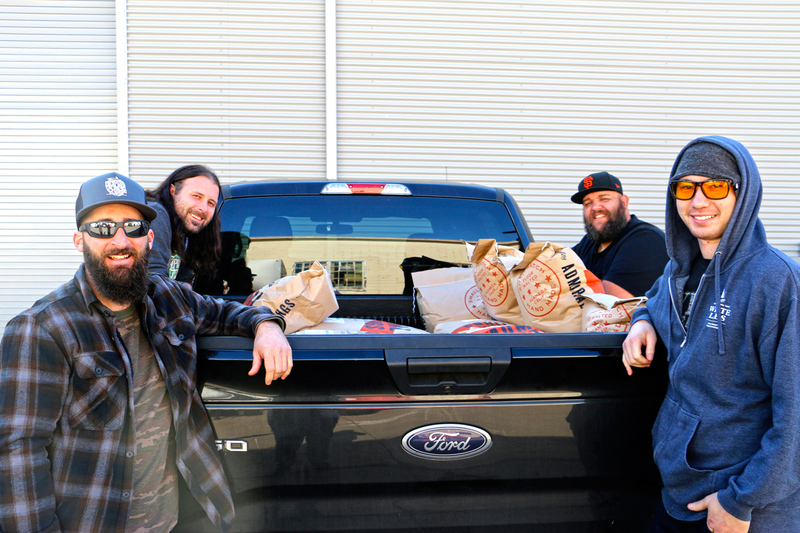 Next door in the same structure, Almanac Beer Company is opening a brewing facility and taproom of its own, while Faction Brewing and Alameda Island Brewing Company provide Alameda island beer destinations. A short tunnel, bridge or scenic ferry ride gets you there. San Franciscans Gail Ann Williams and Steve Shapiro founded BeerByBART.com to encourage the exploration of Bay Area craft beer without driving. Email them at beerbybart@gmail.com.